Mahindra TUV 300 comes with a heavy jawline and thick grille states. Mahindra is very successful already in the premium SUV segment in India. The TUV 300 still looks like a different offering, according to the company the looks are inspired by a battle tank. It comes with a 1493cc mHawk80 which generates maximum power of 84 bhp @3750 rpm giving out a maximum torque of 230 Nm @ 1500-2250 rpm. It is equipped by a 5 speed manual transmission. The SUV comes with a fuel tank capacity of 60 litres and gives out a mileage of 18.49 kmpl (certified). It looks like a low budget version of Jeep Grand Cherokee. The SUV makes it from 0 to 100 kmph in 18.61 seconds. The SUV has a good interior room and is built for stable, comfortable driving. The product has been placed in direct competition to Renault Duster and Ford EcoSport. 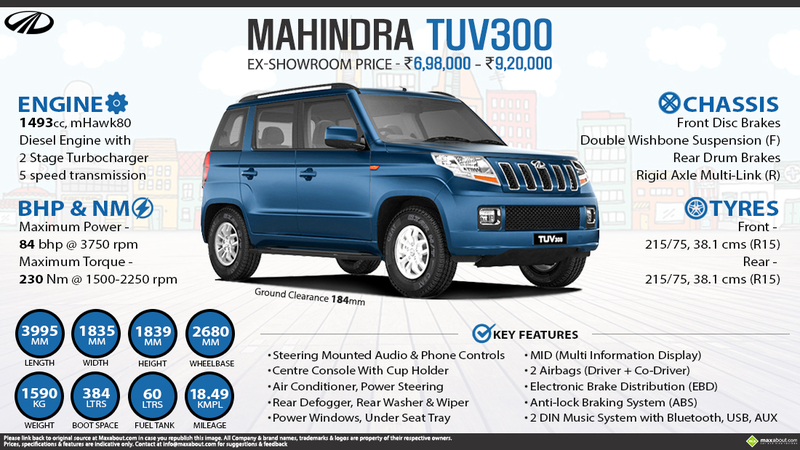 TUV300 also has audio and phone controls on the steering wheel, plus it comes equipped with power windows, cup holder and seat tray. The SUV also comes with an MID (Multiple Information Display). The car weighs 1590 kilograms and has a boot space of 384 litres. It has a length of 3995 mm, width of 1835mm and a wheelbase of 2680 mm. The SUV also comes with 2 airbags and electronic brake distribution (EBD). The engine exactly does not impress with it's performance but it is a comfort driven, spacious alternative in the SUV segment. The lovers of Mahindra brand find a raunchier, heavier alternative with this one. Downloaded 591 times this week.